One hundred and four years ago the political and military leaders of Europe embarked on a catastrophic war, the results of which are still with us over a century later. 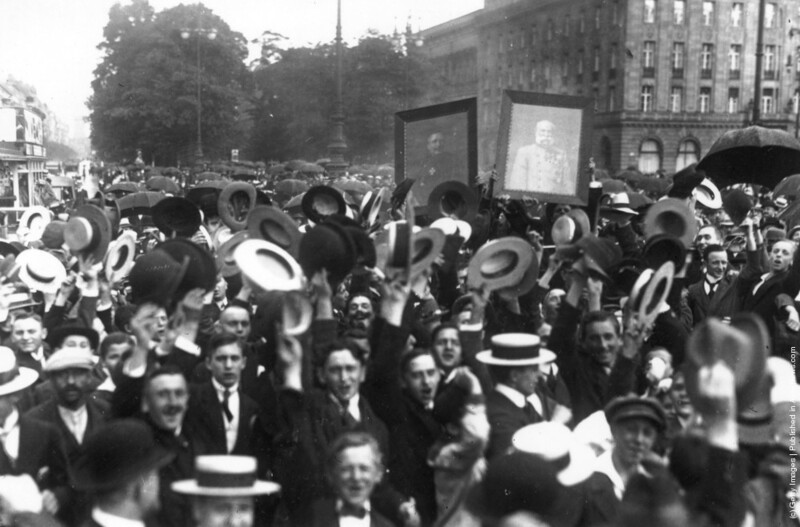 The mobilization of millions of soldiers across Europe was moving rapidly as the sun set on the night of August 2nd 1914 when the German Ambassador to Belgium Klaus Bulow-Selaske delivered an ultimatum to the Belgian government. The ultimatum gave the Belgians 12 hours to decide if they would allow the German armies free passage through the country. The Belgians, treasuring their independence and led by a truly heroic leader, the young and humble King Albert, refused the German ultimatum and vowed to fight. 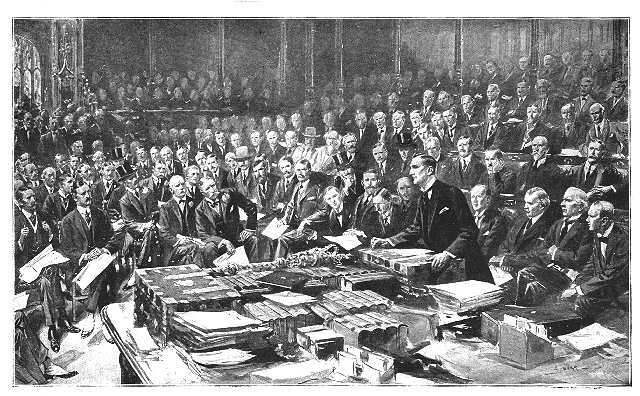 The next morning the British House of Commons met and for the first time since 1893 every member was present, with many spectators also in attendance. It was a dramatic event, as for the first time in 100 years Britain’s participation in a war on the European Continent was being debated. Britain was divided between those who wanted to intervene and non-interventionists. 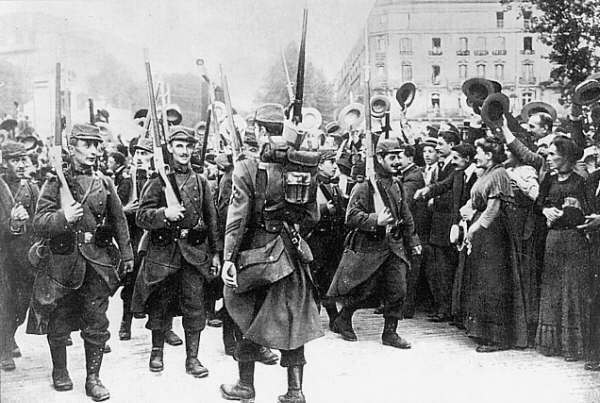 In a high pressure situation where the armies of the Austro-Hungarian Empire, Russia, France, Germany, and little Belgium were mobilizing for war the was on His Majesty’s Government to make a decision. The British Foreign Minister, Sir Edward Grey urged giving support to France. 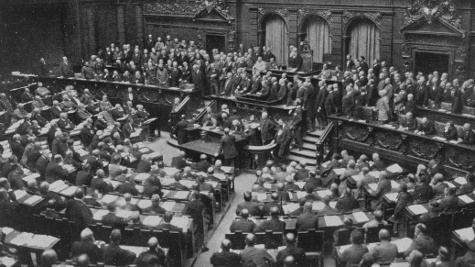 He told the assembled Members of Parliament about, British military understandings with France, and the German ultimatum to Belgium. Grey asked them whether Britain “would quietly stand by and witness the perpetration of the dirtiest crime that ever stained the pages of history, and thus become participators in the sin.” He added that “we are going to suffer, I am afraid in this war, whether we are in it or stand aside.” If Britain dis stand aside, forfeiting her “Belgian Treaty obligations” the she would “sacrifice our respect and good name and reputation before the world.” Grey had not convinced everyone, but he had carried the day. However, the Germans did not believe that Britain would go to war over Belgium. At seven that evening the German Ambassador to France Baron Schoen delivered a declaration of war against France, his counterpart in Berlin, the French Ambassador was given his passports. A similar ultimatum was delivered to Russia by the German Ambassador and a similar scene repeated as Russia declared war. That evening the British Ambassador to Germany Sir Edward Goschen paid a visit to Foreign Minister Jagow with a British ultimatum for the Germans to withdraw from Belgium within twelve hours, or face war. Bethmann, who had helped lead his nation into war believing that the British would remain neutral was stunned. Likewise, none had counted on the Russians to fight. The Germans had given Austria-Hungary a “blank check” and that nation’s leaders cashed it with grave consequences for the world. 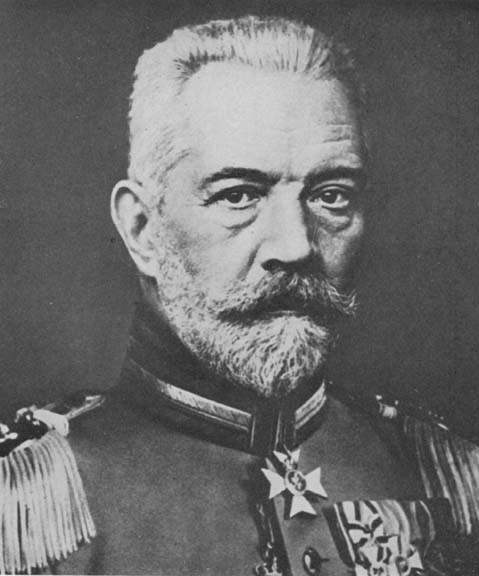 Austria’s actions led to Czar Nicholas making the fateful decision to mobilize on July 29th, which set Europe on course for war. There was no turning back, in four hours the two greatest military powers in the world, Great Britain and Germany would be at war. All all of the leaders in their speeches had left out information that would be embarrassing to their claims in their addresses, duplicity was the order of the day. The lights were going out across Europe. And the leaders of all of the nations, with the exception of Belgium shared some degree of responsibility. The questions for us today are similar: Will all of our leaders allow the lights to go out again, not just in Europe but the Middle East and Asia? and will world leaders allow some foolish action somewhere to bring about more war? Admittedly the situation is not identical, but there are troubling similarities. It is something to think long and hard about. 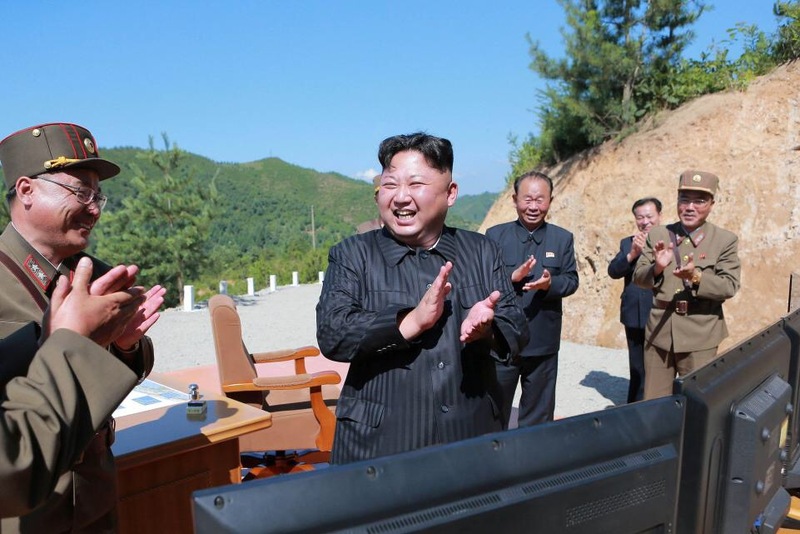 Not long afterward the North Koreans announced that they were examine a plan to attack the American territory of Guam and the bases, which house some of the long ranger bombers used by the United States to buttress its defense of the Pacific it with ballistic missiles. Of course people from across the political, and even the religious spectrum are weighing in on the situation, especially the President’s words to meet future North Korean threats with “fire and fury like the world has never seen.” Of course some of his supporters like Trump’s de-facto Reichsbischof, Pastor Robert Jeffress are all in favor of war. Jeffrey’s said when asked about Trump’s remarks “God has given Trump authority to take out Kim Jong Un.” It is always comforting to know that prominent Christians like Jeffress and the other Court Evangelicals are the cheerleaders of any war party. Of course the opponents of what the President said were not arguing against our national security but for it. The President’s words were dangerous, not because he drew a line in the sand, but because of the parameters of his threat. Instead of being specific and saying if the North Koreans conducted another nuclear test, tested another long range missile, or made a specific kind of military action, he threatened fire and fury if North Korea issued a threat to the United States, which they did a few hours later against the American forces on Guam, a threat that was not met with fire and fury. By threatening fire and fury the President continues to remind people that he is prone to speaking loudly and making great exaggerations, but doing little of substance. Throughout his business career and public life often makes bad “gut” decisions because he prefers to go with his gut rather than hard data or facts. His four corporate bankruptcies demonstrate that all too well. Likewise, his habitual tendencies to lie and exaggerate have already proven detrimental to U.S. foreign policy because world leaders do not believe that he can be trusted. Deterrence only works if people believe that a leader or country will do what it says. That was a hallmark of the Cold War, despite their threats both the leaders of the United States and the Soviet Union understood each other. That understanding was instrumental in defusing the threat of war during the Cuban Missile Crisis, and on a number of other occasions when computer or radar systems gave false alerts which could have resulted in missile launches and war had both sides not understood each other. I only wonder what miscalculation will be next. 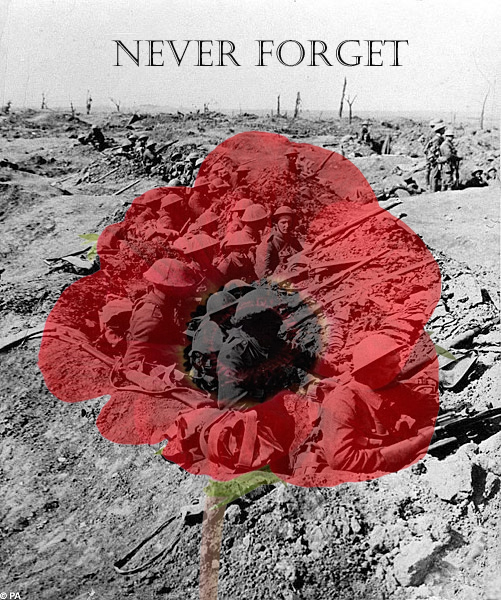 About this time of month one hundred and one years ago the armies of Europe were beginning a four-year bloodletting that killed over ten million soldiers and resulted in twenty million other deaths. That war spawned other wars and conflicts the world over, some of which still go on today. Since I have been to war in Iraq, a war that if we took international law and war crimes seriously would be considered illegal under the codes that we tried the major German and Japanese war criminals under at the end of the Second World War, I take war, and going to war very seriously. The beginning of the First World War provides an example for us of how out of control things can get when leaders opt for war when doing the hard work to keep the peace is much more in their interests. One of the premier military and political theorist who has ever lived, Carl von Clausewitz “No one starts a war–or rather, no one in his senses ought to do so–without first being clear in his mind what he intends to achieve by that war and how he intends to conduct it.” Sadly, few political leaders take his advice. It was a war that should never have happened. It was a war for which the belligerent powers could boast many causes but for which few had any real objectives. One hundred and one years ago this week the armies nations of Europe were beginning clashing on the frontiers of France, Germany, Belgium and Russia. Their leaders were hell bent on waging a war that all thought would be short, decisive and end in victory for their side. The leaders were wrong and nearly a century later the world still pays the price for their misplaced beliefs and hubris of those men. It was a war in large part brought on by the declining Austro-Hungarian Empire’s fears. Fear of neighbors, ethnic minorities and its place among regional and world powers led the leaders of the Austro-Hungarian Empire to decide for war when the very unpopular heir to the throne Archduke Franz Ferdinand was assassinated in Sarajevo, the capital of the recently annexed province of Bosnia-Herzegovina on June 28th 1914. It was a series of decisions by those in the government of the Empire that brought Europe and the world to war, a war which we still feel the effects of today. In particular it was the decisions of the Austrian Chief of the General Staff Conrad von Hötzendorf, the Foreign Minister Leopold Berchtold and the aging Emperor, Franz Joseph which plunged the world into a world war which spawned revolutions, regional wars, a second world war, a cold war and countless other wars. The decisions were based on the belief, still common today that war is the only means of politics. Hötzendorf had been a continual advocate of war in every situation. He lobbied for war in 1907 against Italy and Serbia, in 1908 against Serbia, Russia and Italy, in 1909 against Serbia and Montenegro, in 1910 against Italy and the list increased in the years leading up to the war. He fervently believed that “the use of armed force alone could retard the centrifugal forces of nationalism in the ‘multinational empire’; war was the only means of politics.” The Emperor, Franz Joseph was of the same mindset by 1914 and in the days following the assassination of Franz Ferdinand he gave his approval to the actions of Hötzendorf and the diplomacy of Berchtold that doomed the Austro-Hungarian Empire and would destroy and remake Europe within a span of four years. The leadership of the Empire had decided on war within days of the assassination. 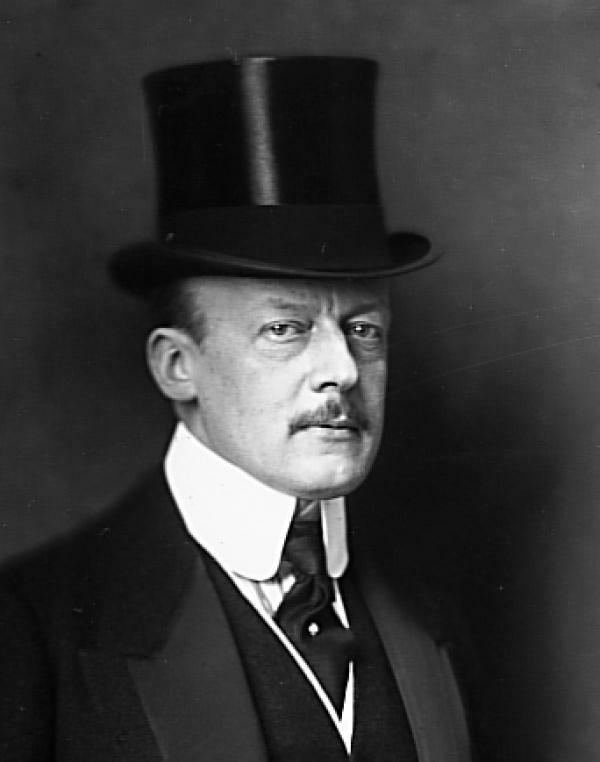 Berchtold dispatched an emissary to Kaiser Wilhelm who decided in counsel with his Imperial Chancellor Theobald von Bethmann-Hollweg gave the Austrians a “blank cheque” of unconditional support for war against Serbia. Berlin was confident that “the Balkan crisis could be localized” and “advised Vienna to “proceed with all means at its disposal” and that Germany would support Austria-Hungary “come what may.” In doing so they willingly ignored the wise counsel of Otto Von Bismarck who considered the Balkans “not worth the life of a single Pomeranian Grenadier. 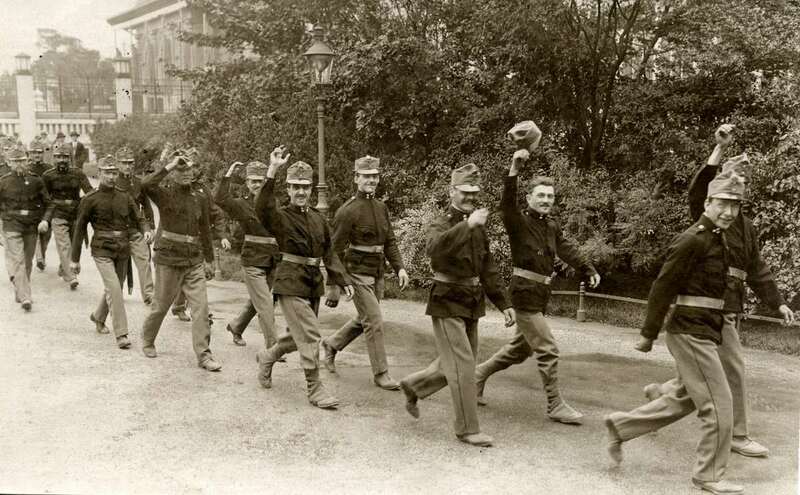 After they received German support the Austrians did everything that they could to ensure that war would occur. Their demands of Serbia were intentionally designed to be unacceptable to that country and they held key information from their German allies in the three weeks after they received the unconditional German support. The Austrians felt that the threat from Serbia combined with internal political factors related to the Hungarian and other Slavic regions of the Empire, and the increasing influence of Russia and Germany in the Balkans was an existential threat. At the same time they were poorly prepared for war. Their military was large but poorly trained and equipped. Their national infrastructure, industry and railroads were ill prepared for the demands of war. Their German allies had not planned for war either and were critically short of the required stocks of ammunition needed for a general war in Europe. The Austrians thought that with German support that even if Russia intervened that the war could be limited to Serbia. They were wrong. Just as the Germans had given the Austrians a “blank cheque” the French, both officially and unofficially were giving the Russians their own blank cheque. French Ambassador Maurice Paleologue assured Russian Foreign Minister S.D. 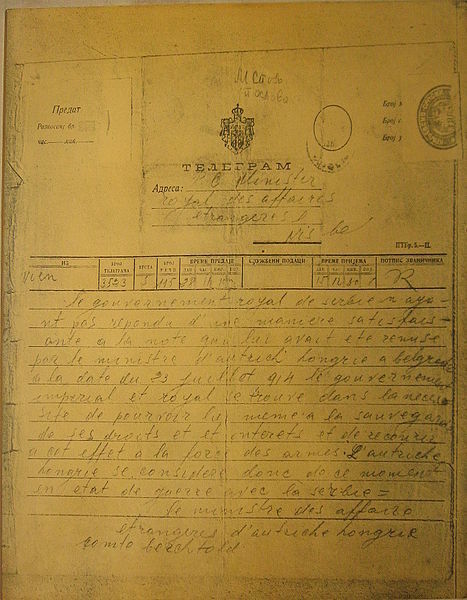 Sazonov of the “complete readiness” of France to fulfill her obligations as an ally in case of necessity. 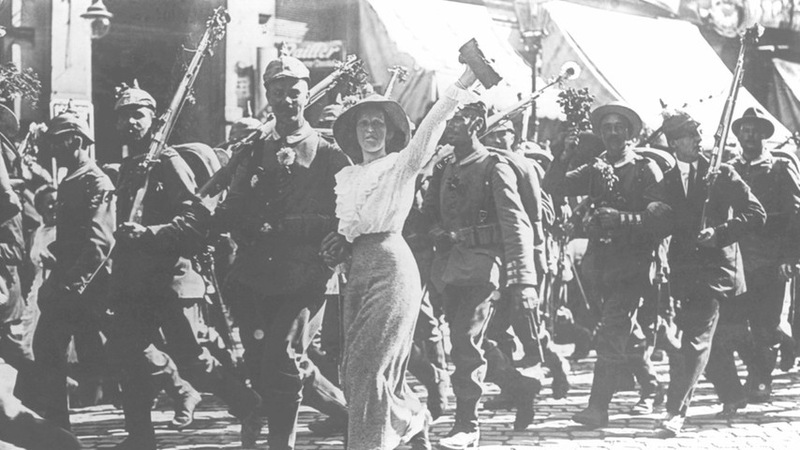 Austria declared war on July 28th, Russia followed by a partial mobilization to support Serbia on the 29th. Kaiser Wilhelm attempted to avert war at the last minute but Czar Nicholas II wrote, “An ignoble war has been declared on a weak country. The indignation of Russia, fully shared by me, is enormous. I foresee that very soon I shall be overwhelmed by pressure to which I am exposed and compelled to take measures which will lead to war.” This was met with German mobilization on the 30th and the French on August 1st. Declarations of war were exchanged and on August 4th in response to Germany’s refusal to respect the neutrality of Belgium Great Britain declared war against Germany. The world again finds itself perched at the edge of the abyss of war. There are people, smart and otherwise reasonable people who believe that they can wage “preventive wars” and rely on brute military force to solve nearly any problem. There are others that suggest that we should not criticize “allies” even when their decisions could be disastrous to them and the world, much as the Germans gave their Austrian brothers a “blank cheque.” I wish that they would just look at the consequences before they commit nations and the world to more war that can only result in calamity and great suffering without benefit for anyone or any nation involved. It was a war that should never have happened. It was a war for which the belligerent powers could boast many causes but for which few had any real objectives. Ninety-nine years ago this week the nations of Europe were hell bent on waging a war that all thought would be short, decisive and end in victory for their side. They were wrong and nearly a century later the world still pays the price for their misplaced beliefs and hubris of those men. 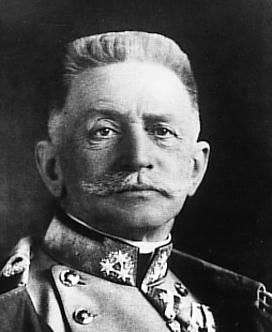 Hötzendorf had been a continual advocate of war in every situation. He lobbied for war in 1907 against Italy and Serbia, in 1908 against Serbia, Russia and Italy, in 1909 against Serbia and Montenegro, in 1910 against Italy and the list increased in the years leading up to the war. 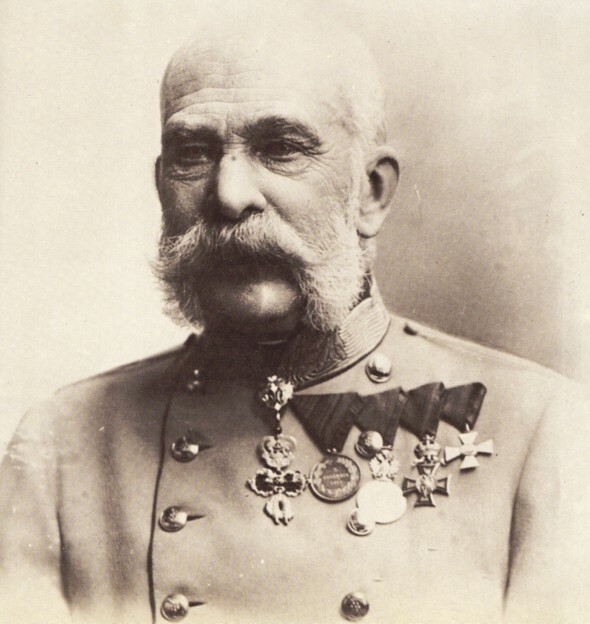 He fervently believed that “the use of armed force alone could retard the centrifugal forces of nationalism in the ‘multinational empire’; war was the only means of politics.” The Emperor, Franz Joseph was of the same mindset by 1914 and in the days following the assassination of Franz Ferdinand he gave his approval to the actions of Hotzendorf and the diplomacy of Berchtold which doomed the Austro-Hungarian Empire and would destroy and remake Europe within a span of four years. The Austrians felt that the threat from Serbia combined with internal political factors related to the Hungarian and other Slavic regions of the Empire, and the increasing influence of Russia and Germany in the Balkans was an existential threat. At the same time they were poorly prepared for war. Their military was large but poorly trained and equipped. Their national infrastructure, industry and railroads were ill-prepared for the demands of war. Their German allies had not planned for war either and were critically short of the required stocks of ammunition needed for a general war in Europe. The Austrians thought that with German support that even if Russia intervened that the war could be limited to Serbia. They were wrong. Just as the Germans had given the Austrians a “blank cheque” the French, both officially and unofficially were giving the Russians their own blank cheque. French Ambassador Maurice Paleologue assured Russian Foreign Minister S.D. Sazonov of the “complete readiness of France to fulfill her obligations as an ally in case of necessity. Austria declared war on July 28th, Russia followed by a partial mobilization to support Serbia on the 29th. Kaiser Wilhelm attempted to avert war at the last minute but Czar Nicholas II wrote “An ignoble war has been declared on a weak country. The indignation of Russia, fully shared by me, is enormous. I foresee that very soon I shall be overwhelmed by pressure to which I am exposed and compelled to take measures which will lead to war.” This was met with German mobilization on the 30th and the French on August 1st. Declarations of war were exchanged and on August 4th in response to Germany’s refusal to respect the neutrality of Belgium Great Britain declared war against Germany. Germany was in pre-revolutionary turmoil. 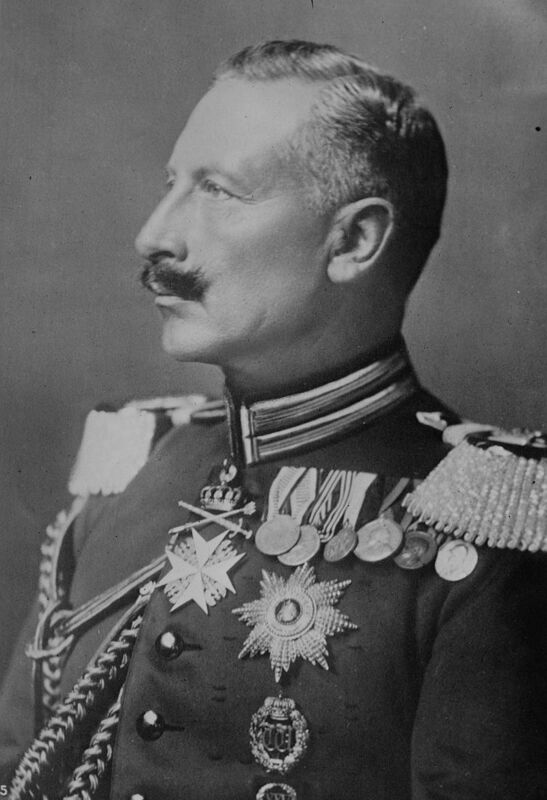 The High Command of the Army had told Kaiser Wilhelm II that military resistance was no longer possible and that the Army would not follow him back to Germany to put down the revolutionaries. After four long years of war in which around 10 million soldiers and 7 million civilians were killed and another 20 million wounded the guns fell silent. In the end it was also the end of an era. It was then end of empires. 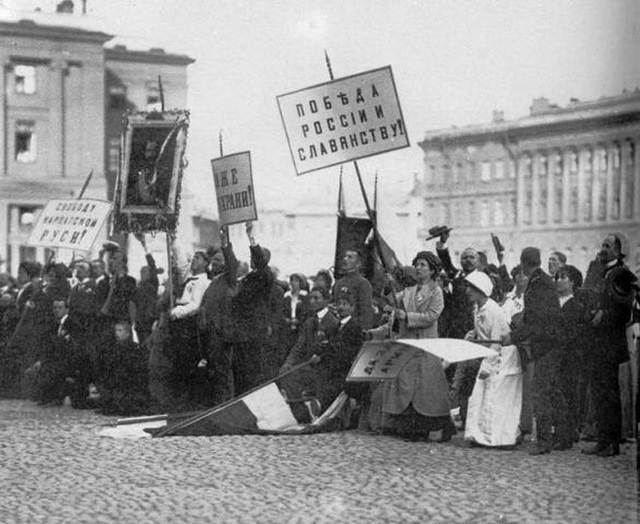 The Russian Empire had collapsed in 1917 and been initially been replaced by a republic and then by a Soviet State and Czar Nicholas II and his family became victims of the revolutionary violence. The Austro-Hungarian Empire collapsed and in its place a hodge-podge of new states as well as liberated areas came into existence. The Ottoman Empire was carved up with its various parts being granted “independence” by the allies under the leadership of tribal leaders supported by the French or British. Britain survived the war but not without crisis due to the massive losses in manpower and economic losses sustained during the war. France nearly fell in 1917 when the Army, demoralized by the unrelenting losses of years of brutal warfare mutinied. Belgium was devastated as was much of northern and eastern France. Most surprisingly Imperial Germany collapsed. After knocking Russia out of the war in 1917 the Germans attempted a knockout punch against France. The offensive, code named Michael was successful at first and nearly succeeded, but in the end ran up against obstacles that could not be overcome, including the arrival of a massive and still fresh American Expeditionary Force. By the summer the tide had changed and the allies were on the offensive and threatening to break through the now vulnerable German lines. At home revolution was in the air, fed by the starvation of the German people and rising unrest units of the High Seas Fleet mutinied, as did units of the Army stationed in Germany proper. Workers and Soldiers Soviets took control of local and state governments. 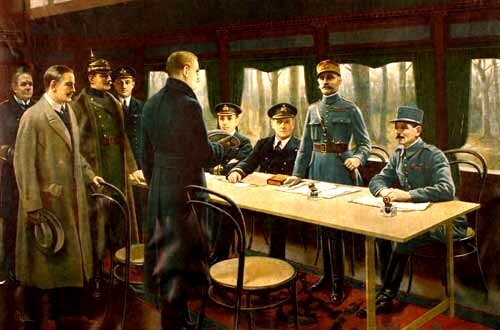 Finally with everything on the line the Kaiser left Berlin to meet with his High Command at their headquarters in Spa, Belgium. It was in Spa that the Kaiser found out that his reign was over. 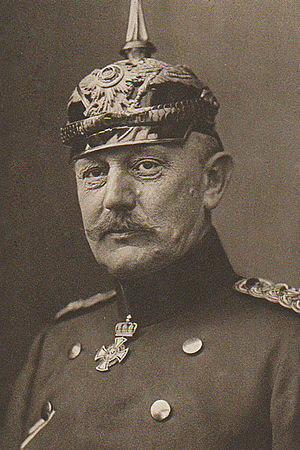 On November 9th General Wilhelm Groener, the Quartermaster General and the de-facto second in command of the Army told the Kaiser that the Army no longer supported him. It was a seminal moment. The Kaiser abdicated his throne and to prevent a communist takeover the leadership of the Social Democratic party proclaimed a republic that day. Hurried negotiations between the Socialists and the Army produced an alliance which averted the threatened Soviet takeover, but also doomed the new Weimar Republic. 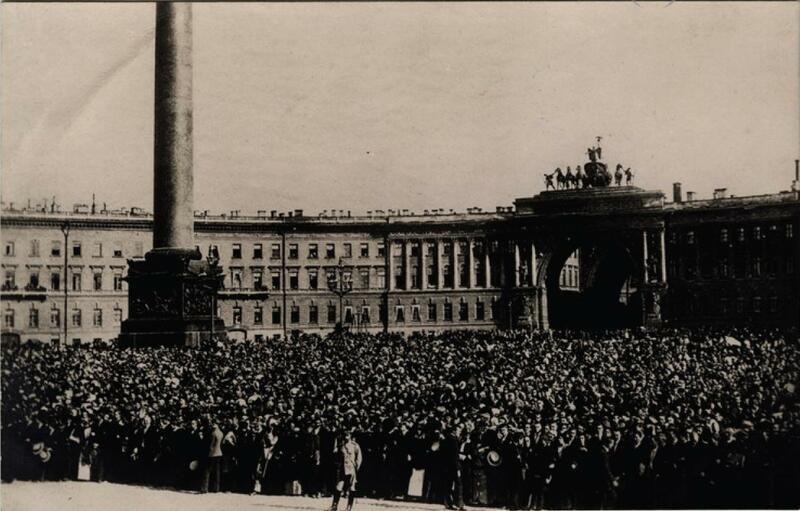 A hated state, it was blamed by monarchists and other conservatives for the German defeat and the humiliation of Versailles and hated by the communists, who viewed it as illegitimate. 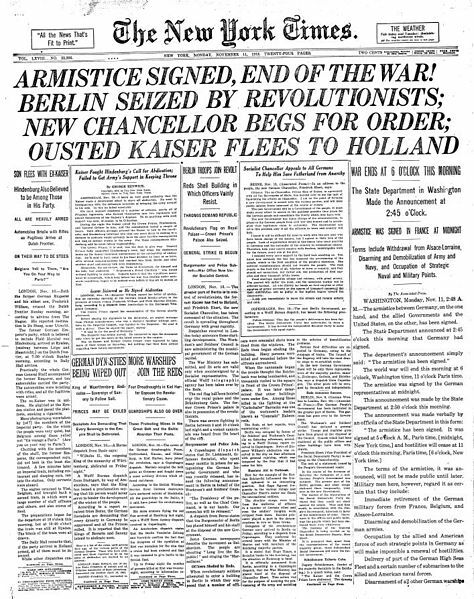 The Germans send a peace delegation to France which agreed to the armistice at about 5 AM on November 11th which stipulated that hostilities were to cease at 1100. The firing stopped and German troops withdrew to a nation totally unprepared for defeat. The allies maintained their naval blockade of German ports until the Treaty of Versailles was signed the following year, wracked by starvation, the great Influenza epidemic, economic collapse and civil war Germany never came to terms with its defeat. Eventually, a crippled Weimar Republic would fall in 1933. Adolf Hitler , a decorated veteran of the war in the trenches became Chancellor and and with an year the undisputed dictator of Germany in 1934. During the interregnum between the wars the victors cobbled together states from the the former empires. Borders were drawn without respect to racial, tribal or religious divisions. The victors, particularly the British, French and Italians expanded their overseas empires at the expense of the former empires and the newly acquired lands. The war that was to end all wars only brought about another even more bloody war that would end with the dropping of Atomic Bombs in Hiroshima and Nagasaki Japan in August 1945. Hitler, who led Germany to ruin died by his own hand in his bunker. The remnants of empires that had not collapsed in the immediate aftermath of the First World War did not survive the second. By the 1970s most of the former colonies of the great empires were independent, but not necessarily free. Tribal and religious conflicts as well as genocide followed in Africa and Asia. A “Cold War” between the former allies of the Second World War followed, only ending with the fall of the Berlin Wall on November 9th 1989, which was exactly 71 years to the day that Kaiser Wilhelm abdicated his throne. Today, though it is nearly a century later the ramifications of that war, a war that was “to end all wars” are still with us. War and more revolution threatens in the Middle East even as former colonies wracked by tribal, religious or ethnic divisions within their artificially drawn boundaries continue to implode. Europe, buoyed by the hope of economic integration following the end of the Cold War is again being torn apart by ethnic and nationalist divisions as the Euro crisis deepened. It was a war that should never have happened. It was a war for which the belligerent powers could boast many causes but for which few had any real objectives. It was a war in large part brought on by a declining empire’s fears. Fear of neighbors, ethnic minorities and its place among regional and world powers led the leaders of the Austro-Hungarian Empire to decide for war when the very unpopular heir to the throne Archduke Franz Ferdinand was assassinated in Sarajevo, the capital of the recently annexed province of Bosnia-Herzegovina on June 28th 1914. It was a series of decisions by those in the government of the Empire that brought Europe and the world to war, a war which we still feel the effects of today. In particular the Chief of the General Staff Conrad von Hötzendorf, the Foreign Minister Leopold Berchtold and the aging Emperor, Franz Joseph.